Toshiba UPS offers the most technically-advanced, efficient and reliable Uninterruptible Power Supply systems in the world. Read about Toshiba UPS & PDU products. Toshiba UPS offers the most efficient static UPS available. With an industry-leading 97% true online efficiency, you've got amazing power protection that won't hurt your electric bill. And with an industry-best 3 year warranty, you've got the assurance that this reliable equipment will handle your critical load for years to come. 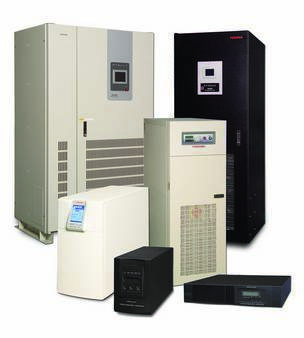 Toshiba Electric Power Products is a world leader in Uninterruptible Power Systems (UPS). In an industry where the competition is using 2nd and 3rd generation technology, Toshiba UPS are using 5th and 6th generation, patented technology. What if you could buy a UPS directly from the company who not only dictates to the industry where the technology is heading, but actually manufactures the electronics in-house, why would you go anywhere else? What if the warranty was twice the industry standard? What if that company had introduced advanced technology and continually improved it for 15 years before anyone else bothered upgrading their old electronics? What if you had service options? Not just contract options (expensive and more expensive), but a multitude of factory trained and authorized personnel who could maintain your equipment? No back-breaking contracts, no software ‘lockouts’, just highly qualified technicians who can offer the best service at competitive pricing? What if you don’t have all of these?- Then you don’t have the best! Toshiba Electric has been designing and building UPS equipment for 25 years. Toshiba has built its reputation on building the best quality UPS systems in the market. From thicker gauge metal framing and skin to corrosion-resistant coatings on the circuit boards, to holding patents on the fastest, most efficient IGBT electronics in the world, Toshiba has dedicated itself to providing a true high quality solution, not just another commodity item taking up space in the electrical room. Contact MonMan today for selection and pricing on Toshiba UPS equipment!